Get those cameras rolling, our next contest is on! And this time, the choice is up to you. We want to see your best photos and videos from any of our park setups tagged with @grouseparks and #houseofgrouse. For this round we've got some more rad gear from RFLF Co. for our winner to take home. Winner will be announced March 19, 2018. 24 Hours of Winter is just around the corner, and we've teamed up with our homies from Blak Headwear. 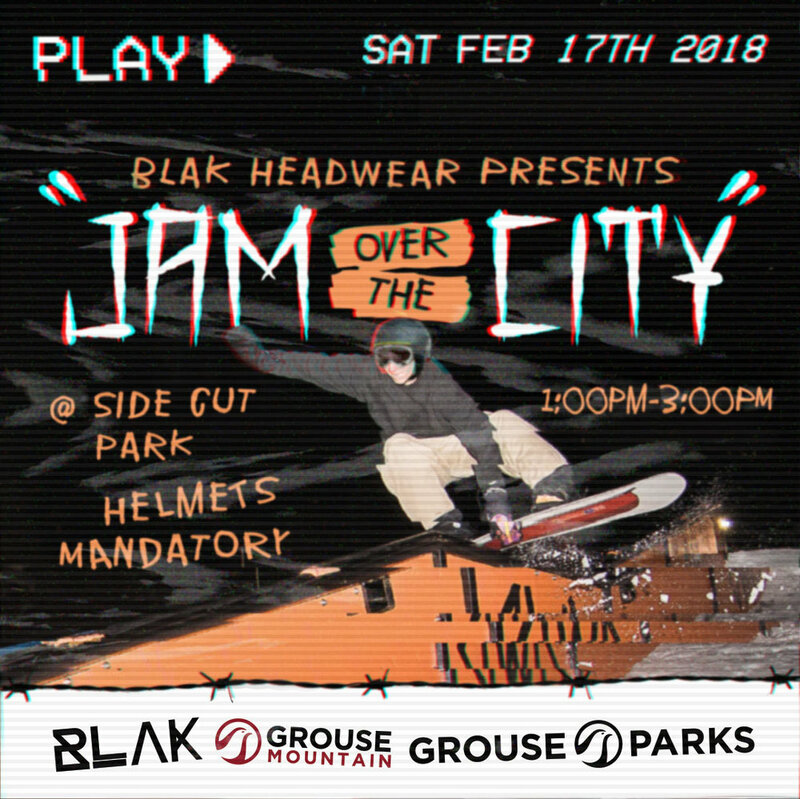 Feburary 17th from 1pm-3pm Blak Headwear will be putting on a very special Jam Over the City. Head on into Side Cut Park for registration from 12pm till 1pm, and look for the Grouse Park Tent. If you are under the age of 18, you will be need a parent/guardian to sign the waiver or you can pre-register here at eventbrite And a kind reminder that helmets are mandatory! Join us for the Habit Movie Premiere + Ski Night on Thursday, February 1. Spaces are limited, so advanced registration is required. Passholders: this event is complimentary with advanced registration. Please note that while this event is complimentary for Passholders, a credit card is required during registration. Since spaces are limited, any "no shows" will have their credit card charged. Non-Passholders: Ticket includes admission to the movie premiere, plus a Snow Ski Lift Ticket to be used from 4:00pm onwards on the night of the event. Please Note: Registration is required for this event for both General Admission and Grouse Mountain Passholders. If you are a Grouse Mountain Passholder, a credit card, valid email address and phone number are still required to register. Your credit card will be charged a $10 “no show” fee if you register and do not attend as space is limited.